Until recently, the U.S. electric grid has mainly relied on centralized power generation and has used grid management procedures that guarantee system reliability. In the near future, system operators will need to address greater uncertainty and variability in the electric grid. This is due to the rapid growth of renewable generation and Distributed Energy Resources (DERs), as well as customers' changing energy use patterns. If DERs are managed efficiently and in coordination with the grid's central generation resources they could support grid reliability, improve the security of the U.S. power system, and increase the adoption of renewable power. The electricity industry has identified Distribution System Operators (DSOs) as one of the potential grid management solutions that will enable cost-effective, large scale integration of DERs into existing electricity grid, while managing their variability and uncertainty. At the same time, the DSO may provide the market mechanisms that empower consumers, and guarantee optimal and reliable grid operation. ProsumerGrid, with its partners, will develop a highly specialized and interactive software tool capable of simulating the operation of emerging DSOs at the physical, information, and market levels while capturing the interactions among the various market participants. The software will offer electricity industry analysts, engineers, economists, and policy makers a "design studio environment" in which various propositions of participant roles, market rules, business processes, and services exchange can be studied to achieve a robust DSO design. The software will utilize a powerful decentralized decision-making algorithm, and extend state-of-the-art grid solvers with the ability to develop DER scheduling, DSO market rules, and energy service transactions. The tool could ensure correctness and reduce risk in upcoming regulatory decisions as various states move towards the formation of DSOs. If successful, innovations from this project will equip industry analysts, engineers, economists, and policy makers with a tool to test various propositions of participant roles, market designs, rate structures, and service definitions. This will lead to more comprehensive and robust DSO designs that are consistent with the physical constraints and decentralized operational paradigms of the future grid. 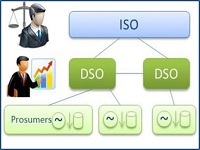 Tools to improve DSO design and delivery that will help enhance grid resiliency and security. DSO development will promote cost-effective use of DERs, such as solar and wind, that can significantly increase renewable generation deployment and can lead to reduction of greenhouse gas emissions. Dramatically reduce the costs and times associated with DSO design studies, simulations, and implementation. Design the market mechanisms needed to empower consumers and DER owners to offer and exchange distributed energy services while maintaining system reliability and operational efficiency.